Free Password Strength Meter for Windows - helps to make your passwords strong and secure. With Password Strength Meter application, you will always be sure, that your passwords can resist attempts to crack it. You will use only secure passwords, which resist guessing and brute-force attacks. Free Password Strength Meter is very easy to use. You need just to enter your chosen password into a special field, and the application will show you the level of its strength. Free Password Strength Meter uses information entropy as a measure of strength and reliability. Entropy measures the number of entropy bits in passwords. For example if your password entropy has 53 bits of strength, it means that your password is as secure as a string that consists of 53 bits chosen by fair coin toss. Each bit of entropy makes your password twice stronger. Free Password Strength Meter is a freeware product. You may distribute unlimited copies of this program in its original form to any legal place unless we notify you otherwise. Free Password Strength Meter works under all modern versions of Windows, including Windows 10, Windows 8.1, Windows 8, Windows 7, Windows XP, Windows Vista and others. We recommend you to use our Free Password Generator for Windows for generating passwords that are random and do not depend on human behaviour. Passwords that people can generate in their mind do not usually have sufficient entropy. Random passwords, generated by a computer, are safe and strong, but they are difficult to remember. In order to keep all your passwords in a secure place, you can use our Password Keeper App for Windows SecureSafe Pro. This password keeper app allows to keep all passwords and private files in an encrypted file inside the program, and you will have access to this encrypted data using a master password. So the master password is the only password you have to remember. Download free and try our Password Manager for Windows - SecureSafe Pro! Keep your passwords and private files secure on your computer, protected by a master password and military-grade encryption standard AES-256. One time charge: lifetime license! Can be run from a USB flash drive as a USB password manager. Free sync across devices via any cloud service (Dropbox, Google Drive, etc.). A built-in random password generator will create strong passwords. Both 32 and 64 bit editions of Microsoft Windows 10, Windows 8.1 or Windows 8, Windows 7, Windows XP, Windows Vista,Windows 2000. Microsoft .Net Framework 4.0 or later. 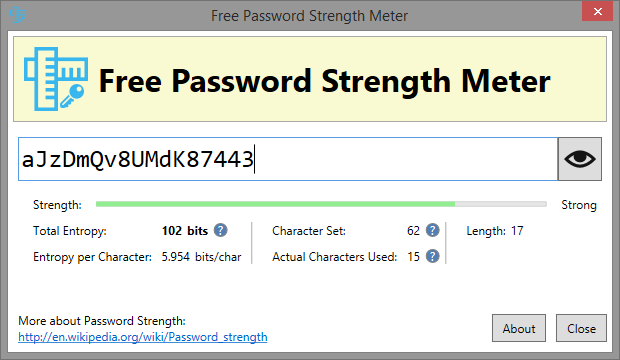 Free Password Strength Meter works under Windows 10, Windows 8 and Windows 8.1 as a desktop application.